Speak to us today about our Stay/Pay combo deals to save up to US$2500! Enjoy an unforgettable trip discovering unbelievable Patagonia landscapes in the comfort of Awasi's luxury villas. Awasi is the only hotel in South America that provides tailor-made service totally adapted to your needs with a private guide and a vehicle assigned to each villa to ensure you can be free to explore the region at your own pace. Discover the flavours of the ‘End of the World’ with Awasi's restaurant which blends local gastronomy and traditional flavours exclusively for its guests. Day 2 & 3: All meals and activities included. 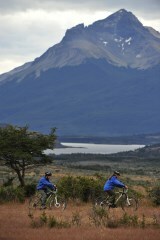 Day 4: Complete your stay at Awasi Patagonia. Departure transfer to airport. * 5 and 6 day tours are also available. Arrive at Punta Arenas where you will be met by a representative from Awasi Patagonia. You will be driven in the hotel’s luxury van to Puerto Natales, gateway to Torres del Paine National Park. The two and a half hour drive will take you along wide open pampas and fjords, through a luxuriant native forest of local species of beeches called lengas and nirres. Awasi Patagonia is situated inside a private reserve neighbouring the Torres del Paine National Park, where you can enjoy imposing views of the Torres del Paine peaks and Lake Sarmiento. You will meet with Awasi guides in the evening who will help you plan your activities during your stay. All excursions are led by Awasi’s expert guide in the hotel’s own vehicles. After breakfast you will start your spectacular journey exploring the beauty of Patagonia by choosing from a variety of activities including walks, bicycle rides, horse rides, and tours in van discovering new landscapes, stopping at the most exotic and remote corners of Patagonia. At Awasi excursions are private (with a guide and a vehicle assigned to each villa) and are planned according to the pace and preferences of each guest. The times, duration and routes of each excursion are defined in line with the special interests and wishes of each guest. Our guests can also tour the private reserve from their villas on their own and explore the different paths, observing the native flora and fauna. Enjoy flora and fauna up close by visiting Torres del Paine National Park known as being one of the most emblematic sites of Chilean Patagonia. It dazzles you with its magnificent scenery of jagged mountains and its lakes of glacial origin with ever- changing turquoise hues. The Torres del Paine National Park habitat melds together a wide array of ecosystems, making it a treasure for Chilean wildlife. It provide shelter to over 120 avian species, 272 plant species and 25 mammal species. Distinctive among these are the puma, which is active mostly in the evening and at night; guanacos and ñandús that graze in groups in the steppes, and the symbols of the Chilean national emblem: the condor, one of the largest birds in the world, and the huemul, an elegant deer in danger of extinction. This biodiversity of glaciers, mountain ranges, forests and waterfalls give rise to a vast array of plant communities that are found in four main biotic areas: the Patagonian steppes, represented by cushions of plants and grasses that adorn the paths with green and brown hues; the pre-Andean brush, where you can see notros (Firebush) and calafates (Chil. berberis); the Magellanic forest that surprises you with the height of its lenga, ñirre and coigüe beech trees; and finally, the Andean desert with its frutillas del diablo (Devil’s strawberry) and llaretas (Andean cushion), mountain species that grow thanks to the ice-melts and abrupt changes of temperature. 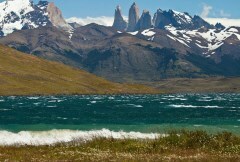 At Torres del Paine, each season of the year has a special charm and poses a different challenge. In summer the days are longer and the temperatures are higher, but it is necessary to cope with the strong winds that are characteristic of these latitudes. During the winter, the short days and low temperatures invite you to walk or ride horseback over the light coating of snow that covers the park – an unforgettable experience. In the spring the park recovers all its natural vigor, with the native plants flowering and the migratory birds returning to give birth to new creatures. Lastly, fall is the ideal time of the year to appreciate the intense reds, oranges, yellow and greens that bedeck the different trees of the park. Awasi Patagonia is situated inside a private reserve neighbouring the Torres del Paine National Park, from where you can enjoy imposing views of the Torres del Paine peaks and Lake Sarmiento. The chosen location is protected from the strong Patagonian winds by a luxuriant native forest of local species of beeches called lengas and ñirres. The indigenous fauna remains intact in these forests and plains, where there are sightings of guanacos, ñandús (rheas), foxes, condors and, occasionally, pumas. The strategic location of Awasi Patagonia invites you to enjoy the Torres del Paine National Park from the privacy of our lodge. Inspired by old Patagonian shelters and ranching outposts, we have built only twelve villas (one of them with two suites) in our private reserve. These are distributed in such a way as to ensure the utmost privacy and also offer the best views of the forest, Lake Sarmiento, the pampas and Torres del Paine. The Master Villa is ideally suited for families, as it measures 140 square meters. It consists of, two suites, a living room, covered terrace and outdoor hot tub. Eleven of the villas have a built area of 80 square meters. Each one consists of a living room, bathtub, separate shower and an outdoor hot tub. A few metres away from the villas are the common areas overlooking the majestic scenery. The main house includes the restaurant, reception desk and comfortable lounges. Protecting the environment and surroundings, our buildings are made of local procured wood, allowing the structures to blend into the incomparable natural landscape.